I am requesting a clarification to SG2 - Robot Expansion. I am not looking for a resolution for our team, our season is complete. I am looking for an official clarification on a rule interpretation so that teams in any remaining regional/state/national tournaments or Worlds do not get into the same discussion with judges that we did yesterday at our state championship. After the first qualification match in a State tournament, we were warned that our robot was making an illegal expansion to climb on the platform and therefore we could not legally get on the platform and would be disqualified if we went on the platform again in the same manner. The students appealed to the head judge and the judge’s ruling was upheld. Robot is a 6 wheel design that has a ‘tail’ that is mounted to the back of the robot on a pivot. At the start of the match, the tail is in the up position tucked against the back of the robot to fit inside 18" cube. It is possible for the tail to rotate 180 degrees down which lifts the back wheels off the ground. However, no matter what angle the tail is at (between full up and full down), the height of the robot never exceeds 18” as measured on a ‘flat plane’ per . Please refer to ‘On Tech Table (Flat Plane)’ image below. The robot climbs the platform by driving up to it and the front two or four wheels climb up on their own. The tail is then dropped which pivots the robot onto the platform and the tail is then raised back up. Please refer to ‘Climbing Platform’ image below. The 18” height limit specified by refers to the Robot height when it is placed on a flat plane, such as a field tile or an inspection table. An 18” tall robot which tips slightly while climbing a Platform would still be legal. 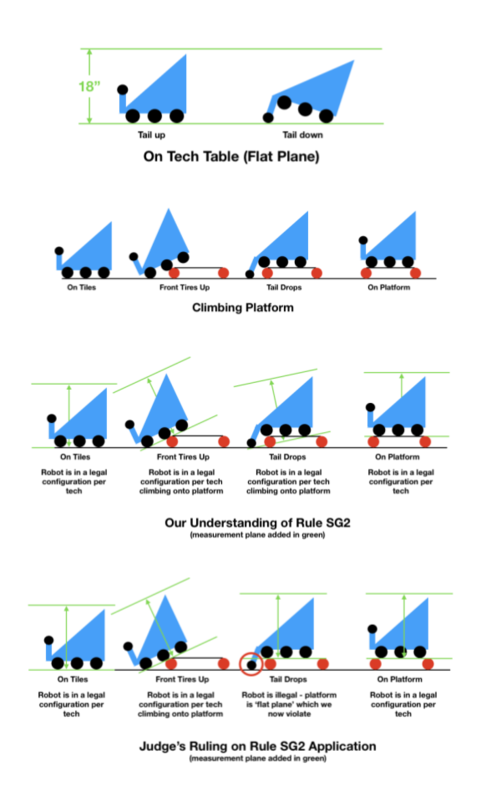 When the tail drops, the robot changes configurations from one legal position to another (remaining legal during the process). By the wording of the rule, in any stage of the process below, if the robot were removed from the situation and placed on a flat plane, it would be just as legal as it was on the Tech table at the beginning of the day. Please refer to ‘Out Understanding of Rule SG2’ image below. When the robot pivots forward onto the platform with the tail still down, it is now sitting on a ‘flat plane’. That plane is horizontal and so a measurement perpendicular to it in the vertical direction results in a height greater than 18” and is therefore an illegal expansion outside the expansion zone. Please refer to ‘Judges Ruling on Rule SG2 Application’ image below. The judges ruling was incorrect as it arbitrarily defined a flat plane for the purposes of height measurement on and in plane with the platform when our robot was not yet fully on the platform. The robot was still in a legal configuration and tilted as it continued to climb the platform. The rule is clear that the measurement is to be made as the robot sits on a flat plane. At the point where the robot tilts forward and the front tires land on the platform, the judge’s position is that we are now fully on the platform and therefore he defines a new temporary horizontal measurement plane on the platform to rule the robot illegal. If at that moment, we were to pick the robot up from the platform and set it on a floor tile in the exact same robot configuration, the robot would be legal. It is our clear position that at the moment the robot falls forward onto the front tires, the robot is in a legal configuration and is NOT yet fully on the platform, but is still tilted in the process of climbing the platform. While the robot ‘appears’ to be sitting level because this is how it often sits when on the floor tiles, it is no as it is in a different configuration. Therefore the robot expansion measurement should be considered in a tilted state where it is clearly legal. A robot that is in a configuration that is legal on the tech table cannot become illegal on the field because of its orientation. We are asking for an official ruling on the legality of this design so that teams going forward to remaining state, regional, national or Worlds competitions have a clear understanding on how to apply the rule. P.S., if you wish to see video of our robot climbing the platform, please search ‘10930D / error 404’ on YouTube - select video ‘Lulu Rocks!’ and move to 0:30 in video. Initially I would have sided with the refs, but after seeing your argument I’m not so sure. You should post this on the official RobotEvents Q&A. I actually favor the Head Referee’s position in this one. This was brought up earlier in the season, someone should have asked on RobotEvents.com Official Q&A where it would have been answered by the GDC. When pushing the limits of design, be aware there comes risks on how different referees will respond to the design without guidance from Q&A. One, the only way to get an official ruling is to post this on the official Q&A as has been stated above. I also agree that your team is playing right at the boundary of the rule. For a brief instant, when the front wheels hit the platform and your tail is still down, I personally would say that it appears that you are exceeding the 18" expansion limit. At that instant, you have completed your tilt and therefore do not remain under the protection of the tilt exception to the expansion,. I realize that this seem a bit nit-picky, but it is the way I see it. And since this is the case, and you are using this to make the climb, the points that you gain could be match effecting. Therefore, you could be subject to DQ. Cool design, I like how simple it is. But, sadly, like @lacsap, and @536Mentor I would have ruled against you. I would have considered the flat plane to be the platform and the robot and the lifting wheel would have put you over. Post it on the Q&A and let us know here how they rule. My season ends on Saturday, so I won’t be reading the Q&A after Friday. As Lacsap said, when you are that close, it pays to put the Q&A in early. Thanks to all for the feedback. I did get it posted to the official Q&A - had to go through the school STEM teacher as she holds the RobotEvents account for all the teams. It went up yesterday, looks like its about a week for most replies. The team did discuss the possibility of the tail violating the expansion rule early in the season and consulted the Game Manual. The team felt the rule was very clearly written as being measured on a flat plane and so we verified the robot remained below 18" on a flat plane no matter the tail position and didn’t think we were pushing the boundaries. We also went through 3 full tournaments (with two final match appearances) with no comment from any judges (know that doesn’t matter at all to the legality, only to our thought that we weren’t pushing the boundaries) . At states, the kids spoke at length with the head judge and made their case. After the ruling they improvised a hard stop on the tail so that it could not go below the level of the wheels so that they could use it in later matches. They kept their cool and pressed on, so not a bad lesson for them anyway. (though I will say they are pretty battle hardened after Worlds last year and not much throws them, so I’m proud of that). At the end of the day we made the finals (barely) but were badly outclassed by the V5 robots. As I mentioned, the final determination doesn’t matter to us anymore, just thought it would be good to have the situation clear if there were any other teams on their way to worlds with something similar. Thanks again for the opinions, we’ll see what the game committee has to say. This is the judging forum. please ask this on the official RobotEvents Q&A.